By David R. Shulman, M.D., and W. Banks Petrey, M.D. 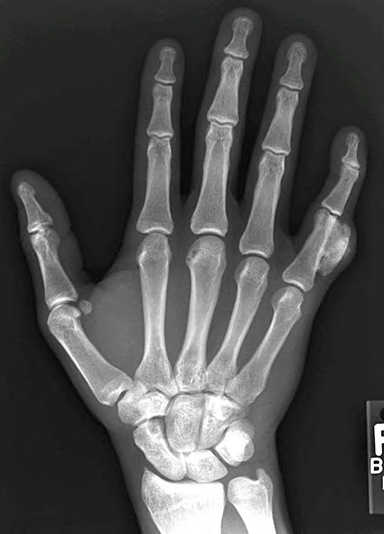 A 31-year-old male presented to the emergency room with a one-day history of right hand pain after relatively minor trauma. The pain was exacerbated with movement. After further questioning, the patient reported an insidious onset of increase in size of the fifth digit, along with decreased range of motion. Physical examination revealed visible enlargement of the right fifth digit without erythema or hematoma. Conventional radiographic evaluation was performed in the emergency department. Osseous exostosis is a relatively common radiologic finding seen in many different pathologies. Evaluation begins clinically with special attention given to the time course of symptoms. Radiologic examination becomes critical to distinguish between the many underlying causes. A key radiologic discriminating factor when evaluating exostosis is the presence or absence of disrupted osseous cortex; followed by structural changes involving the underlying medullary cavity. These diagnostic findings are essential in arriving at the appropriate diagnosis. Conventional radiographs show parosteal calcification or bony masses with a typical mushroom-shape arising from the cortical surface of the underlying bone, usually involving the metaphysis. The lesion may be calcified or ossified with well-defined margins and broad-based attachment to the underlying bone without cortical disruption. There may be decreased mineralization of the cortex of the host bone, but no periosteal new bone formation. Cortical flaring at the junction with the lesion is not a feature of BPOP. The absence of continuity between the lesion and medullary cavity of the bone is a key radiographic finding that differentiates BPOP from osteochondromas. Evolution of the lesion can be seen radiographically with a first stage consisting of periosteal soft tissue swelling or mass, sometimes with tiny calcification; further along in the disease course, calcification becomes more prominent leading to complete ossification of the lesion. Osteochondroma is the most common cartilage containing tumor. Characteristically solitary, metaphyseal, and usually pointing away from the adjacent joint, it is found most commonly around the knee. While osteochrondroma is one of the most common benign bone tumors, they are uncommon to arise in the distal extremities, a feature which distinguishes it from BPOP. The majority of cases occur in young patients less than 20 years old. Imaging of osteochondromas is fairly characteristic with normal marrow, cortex, and periosteum extending from parent bone into the exophytic lesion which has a cartilaginous cap. Histologically, osteochondromas do not display cytological atypia and show more regular alignment of chondrocytes, as opposed to the ‘bizarre’ appearance in BPOP. Patients with osteochondromas commonly suffer mechanical complications related to the exostosis. Occasionally, osteochondromas can degenerate into chondrosarcoma. Parosteal osteosarcoma is low grade osteosarcoma, arising along the surface of bone. The majority of cases are seen between the ages of 20-50 and commonly present with pain and swelling, along with a mass. Parosteal osteosarcoma is most commonly seen along the posterior distal femoral metaphysis, but can involve the tibia and humerus as well. Parosteal osteosarcoma involving the hands and feet is rare.3 On imaging, parosteal osteosarcoma is observed to arise juxtacortically from the bone. The bulk of the mass extends into the soft tissues with smooth, lobulated margins and a characteristic cleavage plane between the tumor and the underlying bone with a “stuck-on” appearance. Parosteal osteosarcoma can dedifferentiate into a higher grade osteosarcoma. Florid reactive periostitis is an entity that falls within the spectrum of diseases that includes BPOP and myositis ossificans. Like BPOP, there is usually a history of antecedent trauma. Florid reactive periostitis most commonly involves the hands, usually affecting a proximal or middle phalanx. On imaging, early florid reactive periostitis appears as an ossified or calcified soft tissue mass without underlying bony abnormality; later, its relationship with periosteum and cortex becomes more conspicuous. Histologically, islands of bone and hyaline cartilage are separated by a fibrous stroma, and focal osteoclastic remodeling of the bone is evident.6 Local excision is usually the definitive therapy; recurrence is uncommon. Osseous exostosis is a relatively common finding which may be seen with a variety of conditions. A combination of clinical and imaging findings aid in narrowing the differential diagnosis and may even lead to a single diagnosis. In this case, the presence of a well-marginated mass arising from an intact underlying cortex was helpful in establishing the diagnosis of BPOP over the more common differentials discussed above. Although a rare entity, BPOP should be considered in the differential diagnosis of an exophytic osseous or chrondromatous growth found in the hand. Dhondt E, Oudenhoven L. Nora’s lesion, a distinct radiological entity? Skeletal Radiol 2006; 35:497-502. Gursel E, Jarrahnejad P, Arneja JS, et al. Nora’s lesion: Case report and literature review of a bizarre parosteal osteochondromatous proliferation of a small finger. Can J Plast Surg 2008; 16(4):232-35. Torreggiani W, Munk P, Al-Ismail K, et al. MR imaging feature of bizarre parosteal osteochondromatous proliferation of bone (Nora’s Lesion). Eur J Radiol 2001; 40(3):224-3. Flint J, McKay P. Bizarre Parosteal Osteochondromatous Proliferation and Periosteal Chondroma: A Comparative Report and Review of the Literature. J Hand Surg Am 2007; 32(6):893-8. Michelsen H, Abramovici L, Steiner G, et al. Bizarre Parosteal Osteochondromatous Proliferation (Nora’s Lesion) in the Hand. J Hand Surg Am 2004; 29(3):520-25. Porter AR, Tristan TA, Rudy FR, et al. Florid Reactive Periostitis of the Phalanges. Am J Roentgenol 1985; 144:617-8. Shulman DR, Petrey WB. Exophytic Osseous Growth. J Am Osteopath Coll Radiol. 2012;1(2):35-37. David R. Shulman, M.D., and W. Banks Petrey, M.D. Dr. Shulman and Dr. Petrey work with the Department of Radiology, Baptist Health Systems, Birmingham, AL.